Think of the biggest upheavals that can happen to you in your life. There’s getting married, of course, or graduating from college and finding a job. Moving can cause a major change in life—sometimes it’s accompanied by another one of those upheavals like a new job. And then there’s having or adopting a child. Having a child is a joyful, stressful, amazing thing. It’s something to look forward to—for months and months, if not years. And maternity leave is a chance for parents to take time off and to acclimate to their new role as a parent, and spend time tending their baby. 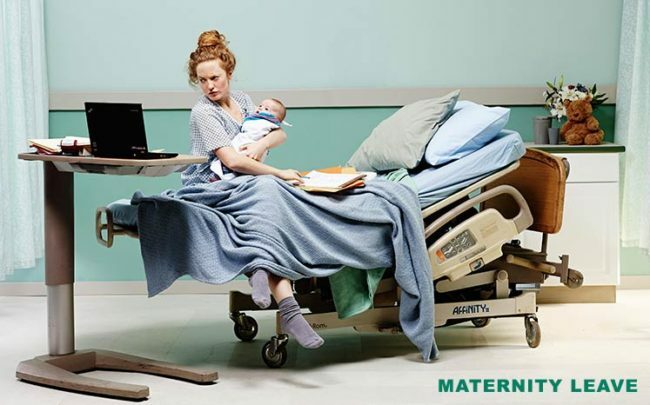 Maternity leave is unusual in that it is often the longest break many working adults get from their jobs. But it’s not a vacation, at all—becoming a parent or taking care of multiple children (if the baby isn’t their first) is a tiring, overwhelming proposition. There’s a new schedule, new demands, and a whole new human to take care of! That’s why going back to work after maternity leave can also be such an overwhelming proposition, especially if you consider the length of leave in the United States. Although 6 out of every 10 women are in the paid labor force, and 8 out of 10 people think maternity leave should be a benefit, the United States doesn’t mandate leave—just one of three countries that don’t make it a priority. As of today, only five states provide paid family leave: California, Washington, Rhode Island, New Jersey, and New York. Many companies offer it as a benefit, but they don’t have to. And in fact, 1 out of every 3 women don’t even take a maternity leave—at all. No matter how much time you get off or what your work looks like once you return, you can take some concrete steps to ensure that those many possible bumps on the way back to work are smoothed out. Start by taking the transition plan—to maternity leave and back to work—in your own hands. Come up with a detailed set of steps that you propose, and work far in advance with your supervisor and your company to see what works for everyone. And don’t delay looking for quality child care. It’s never too early to start looking, and to look at many options. Ask friends and co-workers for referrals, and interview plenty of places so that you figure out what is important for you and your family when it comes to daily childcare. You need to have a place that you feel confidence coming to every day and leaving your baby there, too. 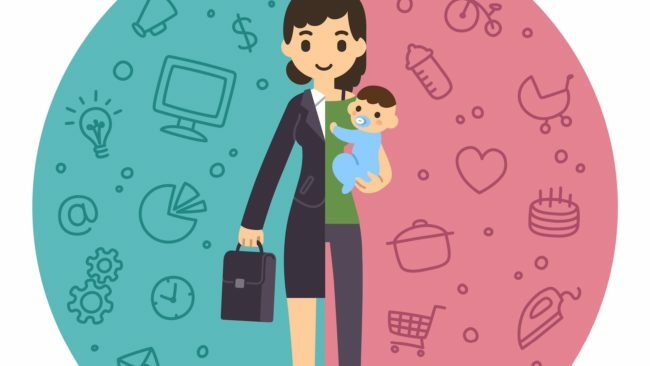 While we wait for major policy and cultural change to happen across America, it is important for mothers to be informed as best they can in regard to support for returning to work after maternity leave. The below infographic and tips provide some guidance. The first year of parenting can be stressful. Many first timers describe new mothering as tiring and chaotic. Expect these challenges: sleep deprivation, an increase in household chores, changes to your social life, and at least a few infant illnesses. Add the stress of a demanding job, and many new mothers burn out. Forty-three percent of highly qualified women leave their jobs after a baby is born. Consider negotiating a period of flexible working hours or part-time work, if you can afford it or your workplace is amenable to the idea. In surveys, mothers who work part time report less stress and more satisfaction with their families than mothers who work full time. In a 2012 Pew Research survey, 60 percent of working mothers said part-time work would be ideal. If part-time hours are out of the question, your employer may agree to flexible scheduling or telecommuting. About 50 percent of companies offer their employees flexible working hours. Come to the negotiation table with a well-thought out plan emphasizing the benefits to your employer. Start here: Research indicates flexible work arrangements are a boon for employee recruitment and retention, and studies suggest home-based employees are 13 percent more productive than those who work in the office. It’s never too early to start thinking about child care, which is a major expense for most parents. American parents with two kids spend anywhere between 20 percent to 45 percent of the median household income on child-care expenses every year. If you plan to interview nannies or visit childcare centers, start early and do your homework. Know what to ask and how to conduct background checks, if needed. Once you choose a provider, be sure to build a positive relationship and good lines of communication. You’ll need to be comfortable talking and sharing information about your child as well as maintaining a financial relationship. Breastfeeding may not be the preferred topic of conversation with your boss or human resources team. However, if you’re committed to exclusively feeding your infant breast milk after you return to work, you’ll need to make sure there’s a clean, quiet, private room with an outlet where you can express milk approximately every three hours. A bathroom is not ideal. Your health insurance plan may cover some of these expenses, so be sure to ask before you buy supplies. A few weeks before you go back to work, express milk once a day so your childcare provider has some in storage. Ask a familiar person (not you) to introduce your baby to the bottle. Don’t be surprised if your infant isn’t keen on it at first, but most babies eventually adjust. If possible, introduce your baby to his or her new caretaker well before going back to work after maternity leave. Plan your new morning routine, with time for feeding the baby, preparing a diaper bag, and driving your baby to her new childcare provider. Then do several trial runs. Use these times as an opportunity to familiarize your baby with the new schedule and surroundings. There are a wide-range of these providers out there, Cultural Care Au Pair are a company whom allow their community to explore and share cultures while offering a childcare service as part of the overall experience. Be kind to yourself as you adjust to life as a working mother. The role can come with conflicting emotions. In one survey, three-fourths of women said they enjoy the work they do, and two-thirds enjoyed the social aspect of working. However, 54 percent of working mothers said they wished they could stay home with their kids. It’s normal to feel a wide range of emotions, including periods of exhilaration, guilt, and exhaustion. Sleep can make a big difference to your mental and physical health and cognitive performance. According to an Australian study, new mothers register medically significant levels of sleepiness even 18 weeks after a baby is born. And the Center for Disease Control found that single working mothers are the demographic most likely to be clinically sleep deprived. Your sleep will likely be disrupted for a while. Newborns wake about every three hours to eat, and some babies don’t sleep through the night until after age 1. Compensate by going to bed as early as possible. Fifty-nine percent of working moms say they have no time for leisure. But it’s important to find relaxing moments, whether it’s walking to work, meeting a friend for lunch, or watching your favorite television show, to help you enjoy each day. Women are at a higher risk for developing depression during the first year after a baby is born, and self-care is an important way to be a happier and healthier mom, professional, and human being. Congratulations, you’re signing up for an amazing journey! Most parents say caring for children is the most meaningful part of their lives. The first months after maternity leave are challenging for most new parents, but you’ll encourage a smoother transition going back to work after baby by knowing what to expect and planning ahead. Great article. Thanks for sharing. 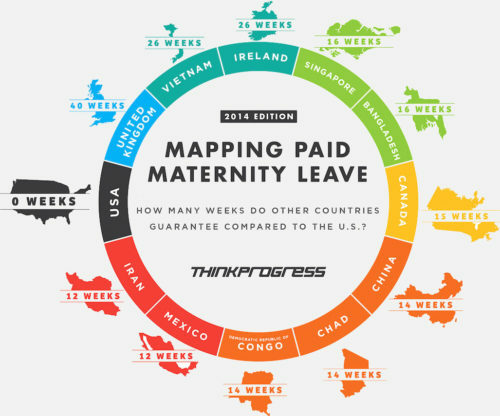 It really is food for thought the disparity in maternity leave throughout the world. One thing I’d add re pumping at work (and you don’t really think of this until you’re stood in the office bathroom with a bunch of tubes, bags and bottles everywhere!) is the cleaning up afterwards. As detailed in this artlcle https://www.stuff4tots.com/how-to-clean-breast-pump-tubing/ it is really important to get breast pumping equipment (especially the tubes) really clean AND dry afterwards. Otherwise they can be a breeding center for all sorts of bacteria and mildew.